A glassy carbon electrode modified with graphene (graphene/GCE) was used for the simultaneous detection of epinephrine (EP) and uric acid (UA) in the presence of ascorbic acid (AA). The electrochemical behaviors of epinephrine and uric acid on graphene/GCE were investigated by cyclic and differential pulse voltammetric techniques. The results showed that both compounds can be effectively accumulated at the graphene/GCE and produce separated anodic peaks for epinephrine and uric acid. This electrochemical sensor shows an excellent performance for simultaneous detection of epinephrine and uric acid with the detection limits of 5.0×10-8 mol L-1 and 7.0×10-8 mol L-1, respectively, and recoveries more than 96.5%. It was also found that the anodic peaks current were proportional to EP and UA concentration in the range of 1.0×10-7 – 6.0×10-5 mol L-1 and 2.0×10-7 – 8.0×10-5 mol L-1, respectively. 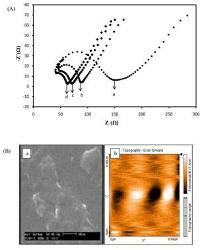 The graphene/GCE was applied to determination of EP in epinephrine hydrochloride injection and simultaneous determination of EP and UA in human serum and plasma samples with satisfactory results.